Few constructs in psychology enjoy such a well-documented and validated track record as intelligence and cognitive abilities. Their applications are widespread and important, although their implications are sometimes seen as ‘controversial’, even socially divisive. Colin Cooper, well known for his television appearances in the BBC programme Test the Nation, details the science and dispels the myths. He has no axe to grind; and his book is incisive, accessible, challenging and exhaustive – he even includes mention of the cognitive abilities required to grow onions! All of this is achieved in a compact and reasonably short book, written in an engaging, informed and amusing style. Importantly, Cooper devotes ample space to discussing the various meanings of intelligence and cognitive abilities, which is just as well because at first blush they can appear elusive, especially to the undergraduate student, who typically comes to the subject armed with a little knowledge but many misconceptions. Another strength of Cooper’s book is how it positions this vibrant research topic in the broader context, especially of the two schools of psychology: experimental/cognitive (which includes developmental and social processes) and differential psychology; with the former focusing on mean differences, where typically differences between people (which always exist!) are seen as a nuisance and assigned to the statistical error term; and the latter, in contrast, taking such individual differences as primary data, using various statistical techniques of association and correlation to describe and assess their impact – and here, Cooper even manages to make factor analysis understandable to the novice. As Cooper correctly notes, ‘For example, social psychologists study variables that influence prejudice in the population, and do not trouble to consider whether or why some individuals are more prejudiced against minority groups than others’ (p.1) – and the same can be said for many other areas of psychology. He is right – and the student reading this will get a deeper understanding of how different ‘schools’ of psychology do, and should, relate to one another: this serves to deepen understanding of psychology and sharpen critical faculties. In eight well-contained chapters Cooper takes the reader through everything that they could reasonably be expected to know: ‘Introduction’ (insightful discussion of different meanings and the experimental/cognitive differential schools); ‘What Are Abilities?’ (description of items, tests, standardisation, and interpretation); ‘The Structure of Mental Abilities’ (delineation of factor analysis, Spearman’s g, and hierarchical models); ‘Alternative Views of the Structure of Abilities’ (presentation of social construction models, self-ratings, unusual abilities, Sternberg’s Triarchic theory, Gardner’s multiple intelligences, and emotional intelligence); ‘Social and Biological Origins of Abilities’ (summary of various genetic methodologies, multivariate genetic analysis, gene–environment interactions, and the limitations with these approaches); ‘Ability Processes’ (discussion of speed of processing tasks, working memory and g, and physiological correlates); ‘Applications’ (examples from education, personnel selection, job fit and performance, health and wellbeing); and a final chapter that is bound to inform and delight, ‘Reflections and Conclusions’, in which Cooper provides appropriately critical discussion of group (e.g. black–white) differences; implications of the Flynn effect (i.e. rise in IQ over the generations, which may explain group differences); interventions to boost IQ (e.g. Head/Sure Start type programmes), neural plasticity and various myths (e.g. ‘magic bullets’ to raise IQ – including the Mozart effect); and the social implications of the ‘bell curve’ theory of Herrnstein and Murray (i.e. advanced technological countries dividing along the lines of levels of cognitive ability) – there is also a section on how cognitive tests might be used to identify and select disadvantaged children for university, especially from the British white working class who are underrepresented in British universities. The thing with Cooper is that, not only is he very well versed in the entire field of intelligence and cognitive abilities, he is entirely level-headed and he conveys all of this in an easy-to-read fashion that belies his vast knowledge. Even technical issues (e.g. the various forms of genetic methodologies) are presented in a way that will not only educate students but should give reading pleasure. This book needs to be on ‘required’ reading lists of psychology students and those in related disciplines. It would also be read with profit, albeit perhaps with dissatisfaction, by those who prefer to dismiss this important field of psychology as pseudo-science. The ‘take home message’ is that, ‘Few theories in psychology have stood the test of time as well as the psychology of human abilities’ (p.217). 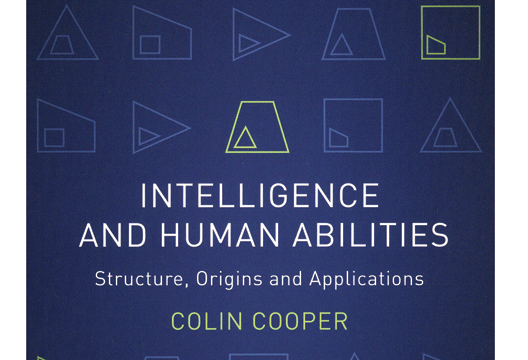 Reader beware: Cooper’s book is likely to charm you into knowing far more about the science of intelligence and cognitive ability than you ever thought possible or appropriate!